State Rep. Margo Davidson has wrecked her state car several times. You foot the bill. Rep. Davidson's state-issued SUVs have taken a beating. As a member of the Pennsylvania House of Representatives, Margo Davidson is entitled to a $87,180 salary with automatic raises, a generous benefits package, and a state-funded vehicle, with fuel and maintenance included. Thankfully for her, taxpayers also cover the car insurance. Davidson, 55, a Democrat from Delaware County, has had three accidents in two state vehicles over three years, including a hit-and-run fender bender this year while driving with a suspended license. And she has found other costly ways to be careless with her state-owned SUV. Last year, for example, Davidson's vehicle was left parked in her Philadelphia-area driveway — unlocked with the keys in the ignition. It was stolen and later was involved in an accident, leading to expensive repairs by the state. State records obtained through a Right-to-Know request show that Davidson's total bill for repairs and insurance claims now surpasses $30,000 — and it could keep growing. Davidson, when asked about her driving record, was nonchalant. "Accidents unfortunately happen from time to time when people drive," she said in a statement. To critics, Davidson has become the poster child for ending the state program that provides House members with vehicles leased from the Department of General Services for up to $628 a month. They point to Davidson's extensive accident record and the fact she was driving without a license as evidence of the program's lack of oversight. "I don't even want to say it's loosely controlled, because it's not controlled at all," said Rep. Brad Roae, a Republican from Crawford County who introduced a bill last year to end the practice of providing state cars to members of the General Assembly. Roae said drivers like Davidson represent a "huge liability" to taxpayers if they are involved in a serious accident. The vehicles used by legislators are insured by the state, not an outside agency. Roae said the Department of General Services does not review a legislator's driving history before providing a car. "They just take your word for it," he said. Davidson's run of driving mishaps began in September 2015 when she rear-ended a car in Lansdowne driven by Melita Webb. Davidson was driving her state-issued 2014 Dodge Journey. State Rep. Margo Davidson, whose driving record has drawn attention to Pennsylvania’s generosity with state vehicles. Webb and her husband later filed a civil complaint. This February, the state paid $12,000 to settle the case. The settlement included a confidentiality agreement. An additional $1,251 was paid to the Webbs in connection with the case, state records show. Two years ago, Davidson was fined $210 for speeding in Virginia while driving a private vehicle. She failed to pay and her license was suspended. That didn't stop her from driving. 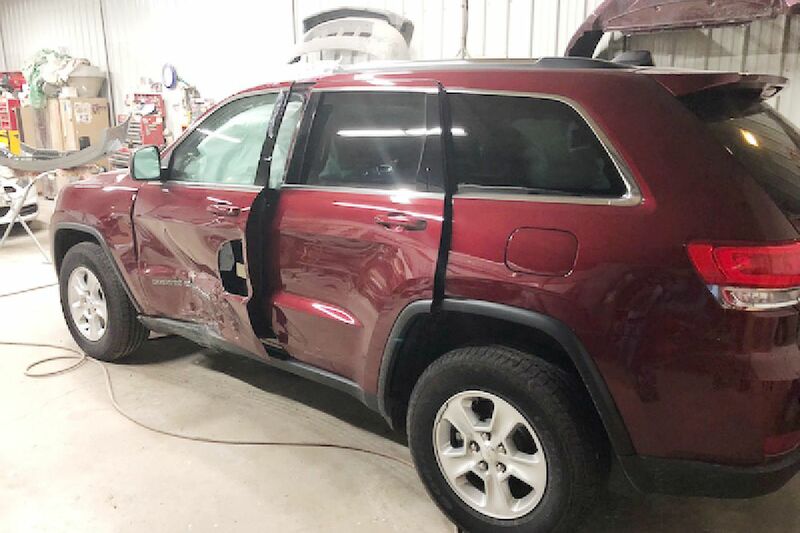 On Jan. 11 this year, Davidson was on I-476 when she rear-ended a Honda Accord with her state-owned 2017 Jeep Cherokee. She left the scene before police arrived and never reported the accident to state officials, as required. Davidson was found guilty in May of driving without a license and failing to notify police of the accident. She paid $149.50 in fines. On Feb. 2, three weeks after the I-476 collision and still unlicensed, Davidson struck a Buick Regal while backing out of a driveway in Concord Township, sending her and the other driver to the hospital. She said the accident was serious enough that she wore a neck brace for a few days. The other driver claimed an injured neck and left arm. The bill for towing and repairing Davidson's SUV was $10,374, according to Department of General Services records. Davidson at the time blamed the other driver. In July, she was found guilty of entering traffic unsafely or without giving an appropriate signal. She paid $50 in fines. Davidson's state-owned vehicle has been involved in two other incidents where the bill was covered by the state. State records show a June 2015 payment of $1,575 to another state employee. Troy Thompson, spokesman for the Department of General Services, said Davidson apparently opened her door and struck the car parked next to her. "My understanding is that the car that was damaged was a Jaguar," Thompson said in explaining the bill. In October 2017, police records show, Davidson's then-state car, the 2014 Dodge Journey, was stolen from her driveway in Upper Darby. Police say the doors were unlocked with the keys inside. The thief crashed into another driver, causing serious vehicle damage and injuries. Invoices show that the state paid $7,207 to repair and refinish Davidson's SUV. Davidson was also fined $221 in September 2014 for failing to yield to an emergency vehicle while driving her state vehicle in Philadelphia, according to court records. Davidson, who was first elected to the House in 2010 and ran unsuccessfully for Congress this year, declined to discuss specific accidents, settlements, or repairs with the Inquirer and Daily News, but in a statement downplayed her checkered driving record. She said her state-funded repair costs "are not out of the ordinary when someone is involved in an accident." It took the Department of General Services until Feb. 14 to learn that Davidson's license had been suspended. As a result, Thompson said, the department told her that she would not receive a replacement vehicle after the accident in Concord on Feb. 2. Thompson said the Department of General Services does not have the authority to monitor representatives' driving history. "There is a provision that requires self-reporting of accidents and changes in the status of driver's licenses, but there is no automatic mechanism in place to do that monitoring," Thompson said. At an April hearing of the House State Government Committee, Kenneth Hess, deputy secretary for procurement at the Department of General Services, said the agency is "taking steps now to provide access or a path for us to get some sort of updates" to prevent another situation where a lawmaker is driving a state car without a valid license. State Rep. Jerry Knowles, who voted in favor of the bill in committee, said Davidson's recent accidents revealed the lack of oversight in the state car program. "I am baffled," said Knowles, a Schuylkill County Republican, "by the fact there is not a better process in place to deal with people who have their licenses suspended or who have not-real-good driving records." Only 27 representatives in the 203-member House are in the state vehicle program. All are Democrats. Twenty are from the Philadelphia area. Participants are eligible for a taxpayer-funded car with a maximum monthly lease of $628. Members of the Assembly can chose instead to be reimbursed .55 cents per mile for using their personal vehicles. For some, reimbursement for mileage can exceed the cost of leasing a state car. Rep. Matthew Bradford, minority chairman of the House State Government Committee, noted that in those cases, state vehicles save taxpayers money. "Unfortunately, the politics may cloud the economics of it," Bradford, a Democrat from Norristown, said at the April hearing. Roae's bill to end the state car program for legislators cleared the state government committee in May, but has yet to come up for a vote before the full House. Records provided by the state Attorney General's Office revealed another quirk in Davidson's 2015 accident with the Webbs. The settlement agreement in that case included a clause stating that the "terms of this agreement are confidential." "All parties to this agreement expressly agree to decline comment on any aspect of this settlement to any member of the news media," it reads. Attarah Feenane, the lawyer who represented the Webbs in their claim against Davidson and the state, said she could not comment as a result. Joe Grace, a spokesman for the Attorney General's Office, which negotiated the settlement on behalf of the state, said such confidentiality clauses are common for the office. After the Inquirer and Daily News asked about the case, Grace said the office gave permission to the Webbs to discuss the settlement. Feenane did not respond to subsequent requests for comment by phone and email. Melissa Melewsky, media law counsel at the Pennsylvania NewsMedia Association, said confidentiality clauses are not enforceable when a government agency is a party to the settlement. "The clauses can't be enforced in court to thwart public access," Melewsky said, "but they can still cause confusion and create a barrier to access, which is obviously not in the public interest." For the record, Davidson has had car woes unrelated to her elected position. In 2013, Davidson was named as a defendant in a civil complaint after a motorcyclist said Davidson's personal Cadillac SRX hit him in 2012 in Upper Darby. But, in that case, it was Davidson's son driving her SUV, according to the motorcyclists's attorney, Adam Grutzmacher. Progressive Insurance paid $14,000 to settle the case. "Guess it runs in the family," he said. Staff writers Dylan Purcell and Holly Otterbein contributed to this article.